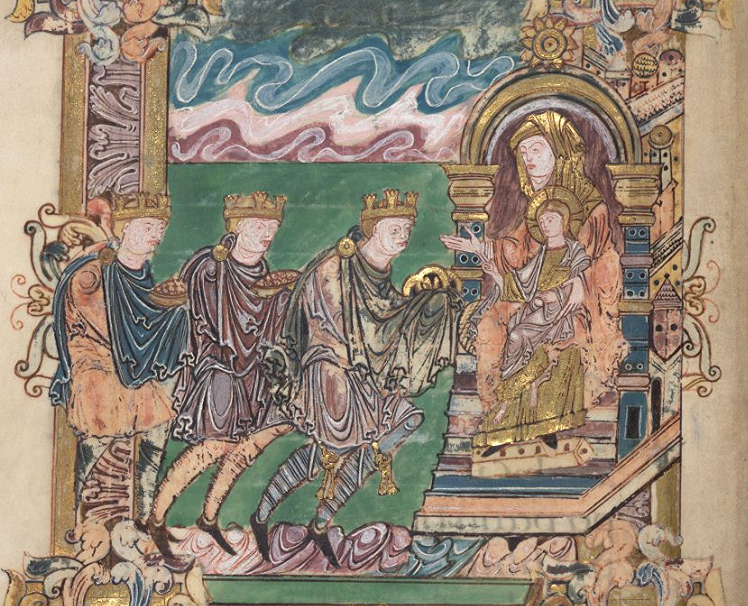 Some extracts from Ælfric's sermon on the Epiphany, which can be read in full here. Ðes dæg is gehaten Epiphania Domini, þæt is Godes geswutelungdæg. On þysum dæge Crist wæs geswutelod þam ðrym cyningum, ðe fram eastdæle middangeardes hine mid þrimfealdum lacum gesohton. Eft embe geara ymbrynum he wearð on his fulluhte on þysum dæge middangearde geswutelod, ðaða se Halga Gast, on culfran hiwe, uppon him gereste, and þæs Fæder stemn of heofenum hlude swegde, þus cweðende, "Þes is min leofa Sunu, þe me wel licað; gehyrað him." Eac on ðisum dæge he awende wæter to æðelum wine, and mid þam geswutelode þæt he is se soða Scyppend, þe ða gesceafta awendan mihte. For ðisum þrym ðingum is ðes freolsdæg Godes swutelung gecweden. On ðam forman dæge his gebyrdtide he wearð æteowed þrym hyrdum on Iudeiscum earde, þurh ðæs engles bodunge. On ðam ylcum dæge he wearð gecydd þam ðrym tungelwitegum on eastdæle, þurh ðone beorhtan steorran; ac on þysum dæge hi comon mid heora lacum... Ða easternan tungelwitegan gesawon niwne steorran beorhtne, na on heofenum betwux oðrum tunglum, ac wæs angenga betwux heofenum and eorðan. 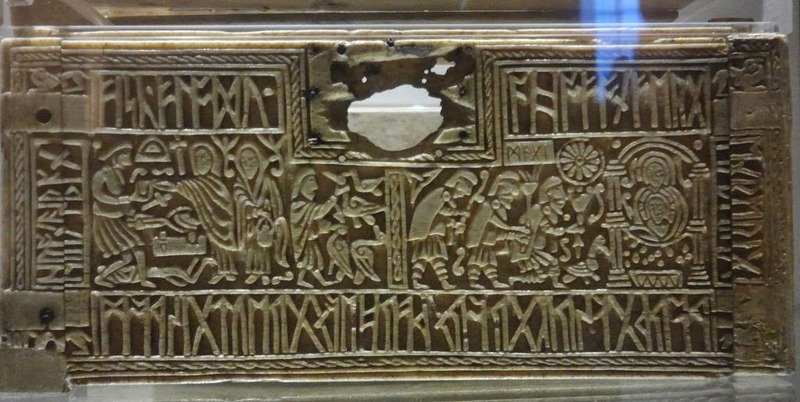 Ða undergeaton hi þæt se seldcuða tungel gebicnode þæs soðan Cyninges acennednysse, on ðam earde ðe he oferglad; and forði comon to Iudea rice, and þone arleasan cyning Herodem mid heora bodunge ðearle afærdon; forðan ðe buton tweon seo eorðlice arleasnys wearð gescynd, þaða seo heofenlice healicnyss wearð geopenod. 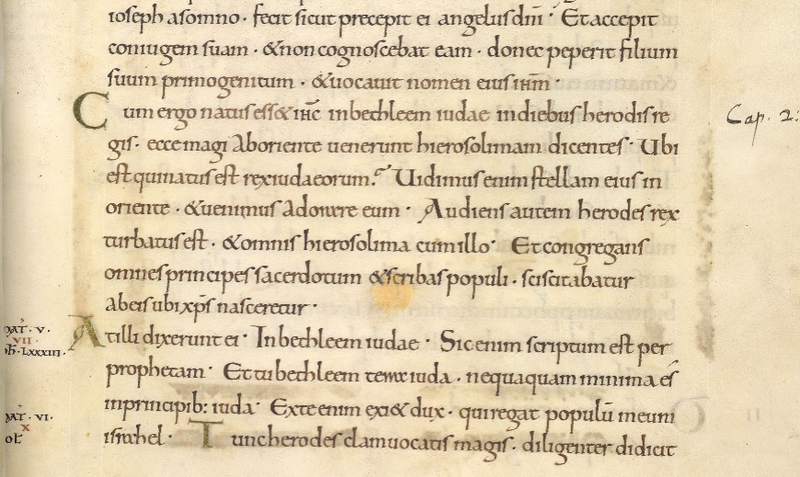 As he often does, Ælfric begins his sermon by translating into English the name of the feast on which he is preaching: in this case Epiphania Domini becomes 'Godes geswutelungdæg', 'the day of God's manifestation'. It is a day of 'making clear', related to OE sweotol. This day is called the Epiphany of the Lord, that is, 'the day of God's manifestation'. On this day Christ was manifested to the three kings, who from the eastern part of the world sought him with threefold offerings. Again, after the passage of years, he was manifested to the world on this day at his baptism, when the Holy Ghost, in the form of a dove, rested upon him, and the Father's voice sounded loudly from heaven, saying, "This is my dear Son, who is well pleasing to me; listen to him." On this day also he turned water into noble wine, and thereby manifested that he is the true Creator who could change created things. For these three reasons this feast is called God's Manifestation. On the first day of his birth he was revealed to three shepherds in the land of Judea, through the announcement of the angel. On the same day he was made known to the three astronomers in the east, through the bright star, but it was on this day they came with their offerings... The eastern astronomers saw a new bright star, not in heaven among other stars, but a lone wanderer between heaven and earth. Then they understood that the wondrous star indicated the birth of the true King in the country over which it glided; and they therefore came to the kingdom of Judea, and sorely frightened the wicked king Herod by their announcement; for without doubt earthly wickedness was confounded, when the heavenly greatness was disclosed. Ælfric calls the star an angenga, a 'lone wanderer', which alone follows its unique course through the heavens. This is an intriguing choice of descriptor, a rare and rather poetic word, which is used only a handful of times in the corpus of Old English literature - twice in Beowulf, where it refers to a wandering wolf and to the monster Grendel, who travels alone by night. But although rare, it parallels two evocative compounds famous in Old English poetry: the anhaga 'lone thinker' of The Wanderer, the solitary exile who journeys and meditates alone, and the anfloga 'lone flier' of The Seafarer, the wandering soul which cries like a wheeling seabird and urges the restless heart to travel and pilgrimage. Following the angenga puts the Magi, whether Ælfric intended it or not, into the company of Anglo-Saxon poetry's seekers, those who journey far from their homeland in search of another and a better home. For Ælfric angenga was, perhaps, an unusual word appropriate for an unusual occurrence - echoing the amazement of the 'watcher of the skies, when a new planet swims into his ken'. Although he begins by talking about the three cyningas, he mostly calls the travellers from 'the eastern part of the world' tungelwitegan, a word which literally means the 'star-wise'. I've translated it in this case as 'astronomers' - although what we would think of as astronomy and astrology were not, of course, separate fields of study in this period - because Ælfric goes on to condemn, at some length, what we would call astrology, the idea 'that every man is born according to the position of the stars, and that by their course his destiny befalls him'. He objects strongly to this, because Nis se man for steorrum gesceapen, ac ða steorran sint mannum to nihtlicere lihtinge gesceapene, 'Man is not made for the stars, but the stars are made to be a light by night for men'. This prompts a lengthy discourse be ðan leasan wenan, þe ydele men gewyrd hatað ('about that false idea, which foolish men call wyrd', i.e. fate) - a topic which much preoccupies the solitary wanderers of Old English poetry. But let's keep to the Epiphany today; if you're interested in his thoughts on the subject, read them here. Mine gebroðra, uton we geoffrian urum Drihtne gold, þæt we andettan þæt he soð Cyning sy, and æghwær rixige. Uton him offrian stor, þæt we gelyfon þæt he æfre God wæs, seðe on þære tide man æteowde. Uton him bringan myrran, þæt we gelyfan þæt he wæs deadlic on urum flæsce, seðe is unðrowigendlic on his godcundnysse. He wæs deadlic on menniscnysse ær his ðrowunge, ac he bið heononforð undeadlic, swa swa we ealle beoð æfter ðam gemænelicum æriste. We habbað gesæd embe ðas þryfealdan lac, hu hi to Criste belimpað: we willað eac secgan hu hi to us belimpað æfter ðeawlicum andgite. Mid golde witodlice bið wisdom getacnod, swa swa Salomon cwæð, "Gewilnigendlic goldhord lið on ðæs witan muðe." Mid store bið geswutelod halig gebed, be ðam sang se sealmscop, "Drihten, sy min gebed asend swa swa byrnende stor on ðinre gesihðe." Þurh myrran is gehiwod cwelmbærnys ures flæsces; be ðam cweð seo halige gelaðung, "Mine handa drypton myrran." Þam acennedan Cyninge we bringað gold, gif we on his gesihðe mid beorhtnysse þæs upplican wisdomes scinende beoð. Stor we him bringað, gif we ure geðohtas ðurh gecnyrdnysse haligra gebeda on weofode ure heortan onælað, þæt we magon hwæthwega wynsumlice ðurh heofenlice gewilnunge stincan. Myrran we him offriað, gif we ða flæsclican lustas þurh forhæfednysse cwylmiað. Myrra deð, swa we ær cwædon, þæt þæt deade flæsc eaðelice ne rotað. Witodlice þæt deade flæsc rotað leahtorlice, þonne se deadlica lichama ðeowað þære flowendan galnysse, swa swa se wítega be sumum cwæð, "Ða nytenu forrotedon on heora meoxe." Þonne forrotiað þa nytenu on heora meoxe, þonne flæsclice men on stence heora galnysse geendiað heora dagas. Ac gif we ða myrran Gode gastlice geoffriað, þonne bið ure deadlica lichama fram galnysse stencum ðurh forhæfednysse gehealden. Sum ðing miccles gebicnodon þa tungelwitegan us mid þam þæt hi ðurh oðerne weg to heora earde gecyrdon. Ure eard soðlice is neorxnawang, to ðam we ne magon gecyrran þæs weges ðe we comon. Se frumsceapena man and eall his ofspring wearð adræfed of neorxenawanges myrhðe, þurh ungehyrsumnysse, and for ðigene þæs forbodenan bigleofan, and ðurh modignysse, ðaða he wolde beon betera ðonne hine se Ælmihtiga Scyppend gesceop. Ac us is micel neod þæt we ðurh oðerne weg þone swicolan deofol forbugan, þæt we moton gesæliglice to urum eðele becuman, þe we to gesceapene wæron. My brothers, let us offer to our Lord gold, for we confess that he is true King, and rules everywhere. Let us offer to him incense, for we believe that he was always God, who at that time appeared as a man. Let us bring him myrrh, for we believe that he was mortal in our flesh, who is incapable of suffering in his divine nature. He was mortal in human nature before his Passion, but he is henceforth immortal, as we all shall be after the universal resurrection. We have spoken of these threefold gifts, how they apply to Christ. We also wish to say how they apply to us in a figurative sense. Truly gold betokens wisdom; as Solomon said, "A goldhoard much to be desired lies in the mouth of a wise man." Incense represents holy prayer, of which the psalmist sang, "Lord, let my prayer be sent forth like burning incense in thy sight." By myrrh is shown the mortality of our flesh, of which Holy Church says, "My hands dropped myrrh." To the born King we bring gold, if we are shining in his sight with the brightness of heavenly wisdom. Incense we bring him, if we set fire to our thoughts on the altar of our heart with the eagerness of holy prayers, so that through heavenly desire we may give forth something of a sweet smell. Myrrh we offer him if we quell the lusts of the flesh by self-restraint. Myrrh, as we have already said, works to keep dead flesh from rotting quickly. Truly dead flesh rots shamefully when the mortal body serves overflowing lust, as the prophet said of a certain one, "The beasts rotted in their dung." The beasts rot in their dung when fleshly men end their days in the stench of their lust. But if we offer myrrh to God spiritually, then will our mortal body be preserved through self-restraint from the stenches of lust. This rather gruesome last section arises a bit more logically in Old English, where there's an obvious semantic link between flæsc and flæsclic (i.e. carnal) lusts, and between dead flesh and the deadlic (i.e. mortal) body. But my favourite line here is Gewilnigendlic goldhord lið on ðæs witan muðe: "a goldhoard much to be desired lies in the mouth of a wise man," Ælfric says, making the words of King Solomon sound for a moment like a line from Beowulf. A great thing the astronomers showed to us by returning another way to their country. Truly, our country is Paradise, to which we cannot return by the way we came. The first-created man and all his offspring were driven from the joy of Paradise, through disobedience, and for eating the forbidden food, and through pride, when he wanted to be better than the Almighty Creator had created him. But there is great need for us 'by another way' to avoid the treacherous devil, that we may come in joy to our homeland, for which we were created. ond þonne geþencan hu we þider cumen. and then think how we may come thither. Hwæt is ðis deadlice lif buton weg? ('what is this mortal life but a journey'?) we heard Ælfric ask a few weeks ago in his Advent sermon, and that journey presses ever onward; 'we cannot return by the way we came', but must go another way. And also this carol for the end of the Christmas season: 'I am Christmas, and now I go my way'. Even 'Sir Christmas' has a journey to undertake in the year ahead! Timely, uplifting and informative. Thank you!